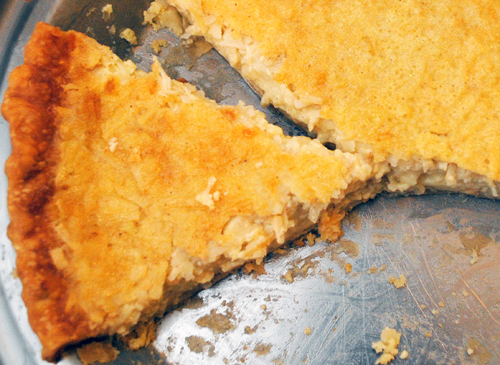 The crust for first Coconut Custard Pie wasn’t chilled enough and melted during the par-bake step. The second pie didn’t have coconut in the custard and instead we just sprinkled coconut on top – and the result didn’t match Jim’s memory of the Glen-Mor Restaurant pie. Finally, third time is charm. This pie was a success at our dinner party on Saturday and again for Jim’s breakfast on Sunday. Preheat oven to 450 degrees-F. Roll pie crust to 12-inch in diameter, place in 9-inch metal pie pan, and crimp edges. Pierce pie crust 20 to 30 times with a fork. Separate one egg and lightly beat egg white, set yolk aside. Brush egg white over crust. Cover edges with aluminum foil to allow the bottom to brown without burning the edges. Bake for 10 minutes. Remove from oven and let cool to room temperature. Crust will not be baked completely, but will finish cooking once the filling is added. In a medium saucepan, heat milk and butter over medium-high heat. Stir continuously with a whisk until boiling, approximately 6 to 8 minutes. In a large mixing bowl, combine sugar, salt, remaining 4 eggs and set aside egg yolk, and vanilla extract. Set bowl aside until milk is ready. Pour hot milk mixture into the large mixing bowl, stirring to combine and make custard. Stir in coconut. Pour custard into the par-baked crust. Reduce heat to 350 degrees-F. If edges have browned, cover with aluminum foil. Bake for 40 minutes. Remove from oven and let cool. Filling will be slightly jiggly.